Rainworth returned to form in the wind and rain of Kirklington Road to end Pickering Town’s three-match winning run. But both sides deserved immense credit for putting on a show of entertaining end-to-end football in the difficult conditions. The Wrens did have the edge for the greater part of the 90 minutes, but it was not ‘game over’ until substitute Liam Theakstone scored their fourth goal in the 81st minute. Twice Rainworth led, twice the Pikes equalised, but the North Yorkshire club could not find a third way back after Connor Smythe’s superb individual effort put the Wrens 3-2 up before Theakstone made the three points safe with a goal of equal quality. 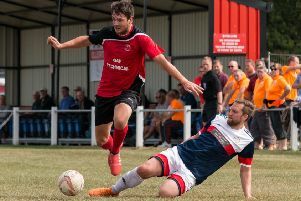 Jamie Yorke had fired Rainworth into a 2-1 interval lead with goals in the second and 23rd minutes either side of Callum Ward’s 12th minute penalty. And although Lewis Taylor again brought Pickering level with a long range free kick from the right which seemed to take everyone by surprise, it was not to be their day. Rainworth made just one change in personnel from the side which had lost ingloriously at Pontefract a fortnight earlier, bringing in new midfielder Jack Barnett from Worksop Town, with Gareth Campion unavailable. And they were ahead inside the first two minutes. Jack Andrews farmed the ball out from his own half to Liam Morris on the right, and he found a way around the back of the Pikes’ defence before crossing low to the near post where Yorke completed the job. Stung Pickering hit back, and Wrens keeper Sam Leigh had to be at his best to produce a great double save, before Smythe headed off the line for a corner. Pickering’s pressure told, though, in the 12th minute. Defender Craig Morley was reduced to bringing down Ward in the box, and Ward got up to lash an unstoppable penalty. Rainworth set about regaining the lead and Yorke’s seemingly goalbound effort took a deflection which directed it just wide. And from the resulting corner Morris’ towering header just cleared the bar. But within seconds the Wrens had regained the lead, and this time it was Yorke who, enjoying his role further forward, profited from a deflection when Declan Brewin’s initial effort struck a defender and rebounded into his path for a clinical finish from the edge of the box. Indeed Yorke could and should have had his hat-trick on the half-hour, when he found himself in the clear only to finish weakly straight at Peter Lawrie, while Sam Dockwray was unlucky to see his downward header bounce high and be tipped onto the crossbar by the keeper. As Rainworth enjoyed a purple patch Morris was again just off target and Brewin saw a shot well saved. Smythe’s only error of the match almost let in James Bennett almost on half time, but the Pickering man was always stretching and steered his attempt well wide. Smythe atoned for that three minutes into the second half with a trademark run to set up Yorke whose driven finish flashed just the wrong side of the post. Pickering failed to capitalise on a fumble by Leigh, but they were level in the 57th minute when Taylor’s long free kick from the right touchline somehow found its way through everyone and into the net off a post. However, parity lasted only 10 minutes before Smythe’s super jinking solo run into the box brought its reward with a low finish. Pickering, who on Wednesday had overturned a 2-1 interval deficit at Albion Sports and roared to a 5-2 win, seemed then to lack the heart to force an equaliser against the Wrens for a third time, and as Rainworth pressed further Yorke was cruelly denied his hat-trick again when the ball struck Morris and rebounded away from goal. Shortly afterwards Morris was replaced by Theakstone, and he staked his claim for a starting shirt with a superb fourth goal. Clearing the ball from a Pickering corner, he surged forward, attacked the by-line, fired the ball into the area, picked up the return and gleefully finished with aplomb to send the home fans, and his manager Julian Watts, into raptures. And it might have been five in the 88th minute when Matty Sykes’ rising drive cleared the bar by only a matter of inches. RAINWORTH: Leigh, Hanson, Smythe, Barnett, Morley, Andrews, Yorke, Dockwray, Morris (Theakstone 73), Brewin, Sykes. Subs not used: Bingham, Pereira. PICKERING: Lawrie, Tilsley (Lingard 41), Bissett, Hope, Turnbull, L. Taylor, Bennett, T. Taylor, Ward, Cooper, Dalton. Subs not used: Ingram, Marshall. MAN OF THE MATCH: Connor Smythe.